As the first day of the competition comes to an end, there is a lot to look back on. After leaving for their shoots in the early hours of morning the photographers return for lunch at Narain Niwas. 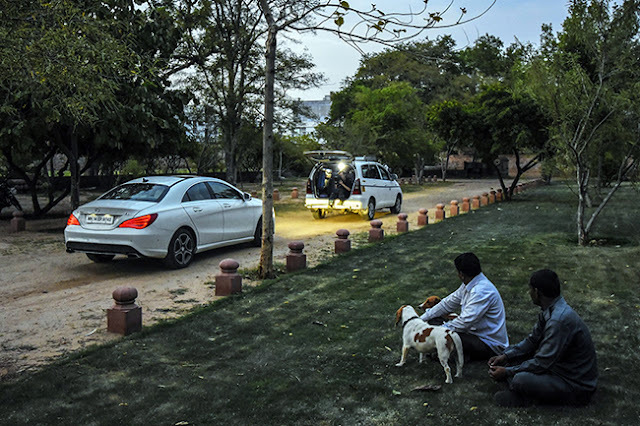 During that time each of them managed to explore Jaipur with their respective Mercedes-Benz CLAs. William headed out to Lebua as his first destination. Although the place is known for its beautiful and luxurious resort, he opted to shoot the CLA in the surrounding area. With few people to bother him and scenic mountains surrounding him, William couldn’t have asked for a better place to shoot. Later, he travelled to Ramgarh Lake in hopes of getting some better shots. The artificial lake there has been dry since 2000, but William managed to find a remote village location. While shooting at Jal Mahal he ran into Ketan who seemed to have had the same idea. After meeting his competition there, Ketan headed for Amer fort to compliment the stylish CLA with the architectural beauty of Jaipur. The Amer Palace stands tall on the Aravalli hills and features serpentine staircases. It is a major tourist destination and provides the ideal backdrop to shoot a luxury sedan. On his driver’s suggestion Ketan ventured to Hathi Gaon in hopes of capturing a few elephants with the CLA. Sadly the elephants were bathing in the lake and were unavailable to pose with the car. Arpit found his way to Hathi Gaon as well and had the same amount of luck. The next destination for Arpit was Nahargarh fort at the edge of the Aravalli Hills. It towers over the city and served as the shooting location for the jump scene in ‘Rang De Basanti’. Another familiar face that visited this majestic site is Naveen. And another familiar place that Naveen visited is Jal Mahal. It’s obvious by now that these four contestants had some venues common among them, including their final destination. Around 3:30 PM I tagged along with Naveen and Ketan as they headed for Castle Kanota. On the way they made the wise decision of using each other’s car for tracking shots. They managed to capture a lot of attention and pictures as they each took turns clicking photos from the sun roof while the cars were in motion. After we reached Castle Kanota, it was a long and tedious process of setting and removing ramps for the cars. However, this gave the photographers the freedom to take the car to areas that would otherwise have been inaccessible. Soon two photographers became three and three became four, as all the contestants found themselves in the same location. These fierce competitors were able to put their rivalry aside and enjoy tea and sandwiches together before heading back to Narain Niwas. On the way back Naveen and Ketan were able to click more tracking shots, this time with the help of two Innovas. There was no shortage of eyeballs following us as the photographers opened the back doors of the Innovas and started clicking pictures of the CLAs that were driving close behind. 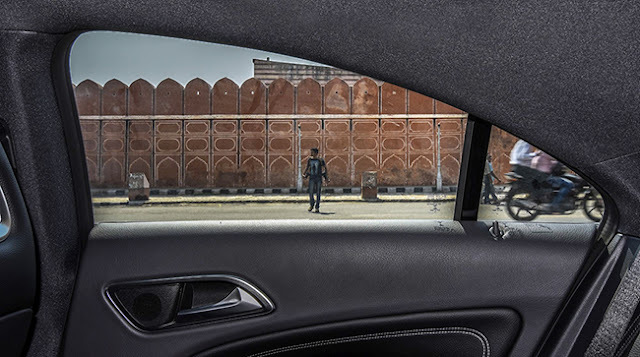 All in all the first batch of photographers showed a great sense of ingenuity when it came to framing the elegant and stylish Mercedes-Benz CLA. They shot it against the backdrop of various forts, complimenting the sophisticated design of the CLA with the architectural beauty of Jaipur’s landmarks. It’ll be fun to see what the next batch of photographers bring to the table and what tricks they have up their sleeves.